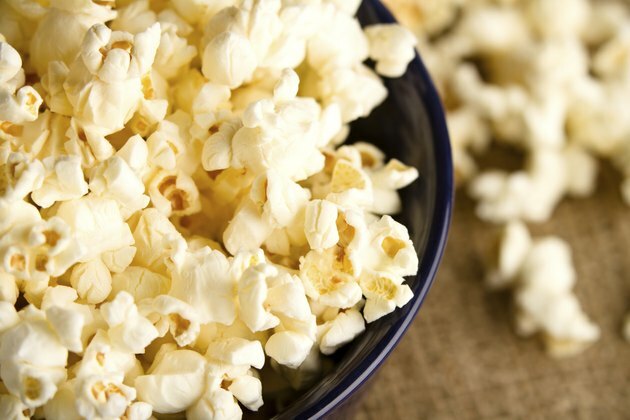 Whether you are curling up in front of the television to watch your favorite show or gearing up for a movie night, popcorn may be your go-to snack. Microwave popcorn options are convenient but controversial due to the amount of fat they contain. Yet, an ounce of plain, unpopped popcorn kernels only contains 1 g of fat. If you're on a diet, every gram of fat counts, so it's important to monitor your intake. You can purchase natural popcorn kernels and pop them yourself without oil. Preheat a stovetop burner on medium-high heat. Pour 1/3 cup popcorn kernels into a medium-to-large pot. This amount of kernels produces 2 quarts of popcorn when popped. If you need more than this, cook the popcorn in batches. The popcorn needs room to pop; doubling or tripling the recipe and attempting to cook it at one time will prove to be unsuccessful. Place the pot on the stovetop and cover with the lid. Grab each handle of the pot if they are heat-resistant and won't get hot during cooking. If the pot doesn't have handles or if the handles are not heat resistant, use clean hand towels or oven mitts to hold the middle edges of the pot on each side. Be careful not to touch the stovetop burner. Shake the pot lightly back and forth several times to move the kernels around. This prevents them from sticking to the bottom of the pan. Within a few seconds, the popcorn should begin to pop. Listen as it pops and shake the pot three times every 10 seconds. When you hear the popcorn popping begin to slow, remove the pot from the heat, but keep the lid on. Remove the lid when you no longer hear the popcorn popping. This could take between 15 to 30 seconds. Pour the popped popcorn into a bowl and sprinkle lightly with salt. For added flavor, sprinkle with a seasoning, such as parmesan cheese, chili powder, paprika, cumin or curry. Toss the popcorn lightly in the bowl to distribute the seasonings and serve.